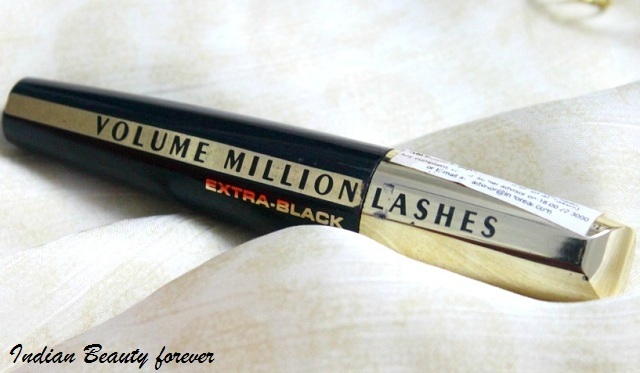 I will review L’Oreal Paris Volume Million Lashes Mascara today. I good mascara is very important to open up your eyes and mascara alone can have a dramatic effect. 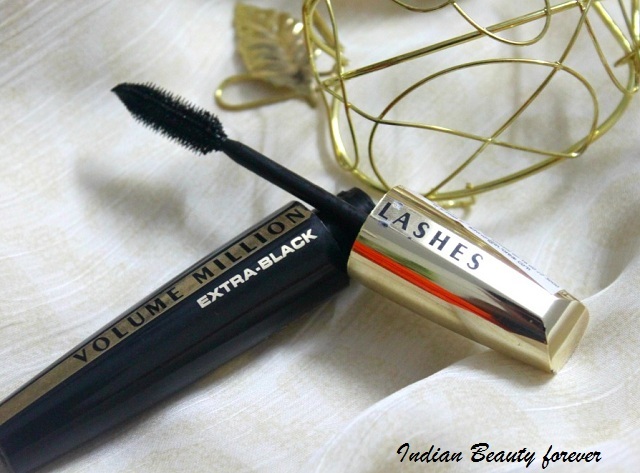 Price: L’Oreal Paris Volume Million Lashes Mascara is price in India for 700 Rupees. Product Description: Don’t just volumize your lashes, with our New L’Oreal Paris Volume Million Lashes Mascara. The Millionizer brush has a multitude of bristles to separate lashes for a fanned-out lash effect. The elastomer applicator is ultra flexible with both long and short bristles to coat each lash evenly from root to tip. The excess wiper removes excess mascara. It leaves the brush coated with just the right amount of formula to achieve maxed up volume with no overload and no clumps. Ingredients : Aqua/Water, Paraffin, Potassium Cetyl Phosphate, Cera Alba/Beeswax, Cera Carnauba/Carnauba Wax, Acacia Senegal/Acacia Senegal Gum, Glycerin, Cetyl Alcohol, Hydroxyethylcellulose, Phenoxyethanol, PEG/PPG-17/18 Dimethicone, Steareth-20, Phenethyl Alcohol, Sodium Polymethacrylate, Propylene Glycol, Hydrogenated Jojoba Oil, Hydrogenated Palm Oil, Pentaerythrityl Tetraisostearate, Disodium EDTA, Polyquaternium-10, Soluble Collagen, Silica, Panthenol, Silica Dimethyl Silylate, Sodium Chondroitin Sulfate, Atelocollagen. May Contain: CI 77491, CI 77492, CI 77499/Iron Oxides, Mica, CI 75470/Carmine, CI 77288/Chromium Oxide Greens, CI 77289/Chromium Hydroxide Green, CI 77007/Ultramarines, CI 77891/Titanium Dioxide, CI 77510/Ferric Ferrocyanide. Quite a long list!! Isn’t it? 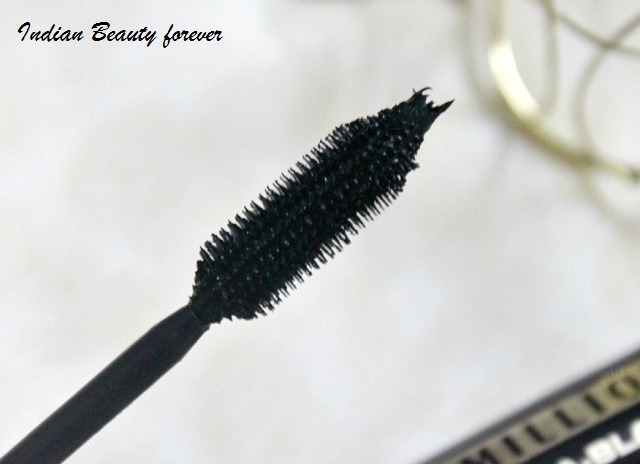 Experience: The L’Oreal Volume Million Lashes Mascara comes in a black and gold glossy tube. The product details are printed along its body. The packaging looks decent and classy. The mascara brush is perfect and really good in terms of quality. The mascara brush has lots of bristles to instantly add volume and length. The packaging is designed well and the brush doesn’t pick up excess product. The wand coats the lashes evenly and gives a complete finished look by coating it from root to tip though there can be some clumping while you are going for multiple coats. Apart from that, the mascara is well formulated, it dries off quickly and I did not notice any trouble. It gives a huge difference to the lashes, it volumizes and lengthens it beautifully. For people like me who shy away from false lashes, this product comes as a saviour. I love this mascara and from the day I bought it, I have been using it day in and out. This is the best mascara, I own in my vanity. It also volumizes, lengthens and holds a pretty curl with slight clumping. I run it along my lashes with good three or four swipes and it gives an excellent effect. The pigmentation of the mascara is really intense it gives a solid jet black color. The staying power of the mascara is again impressive. It stays on me for more than 8 hours easily. The formula of the mascara is not waterproof but it works very well on me. The mascara can be easily removed with any makeup remover as it is not waterproof. Overall, the mascara volumizes as well as lengthens lashes. The finish of the mascara is well defined and gives a pretty fanned curl look. Take: I absolutely love this mascara. I will definitely go back and repurchase it. If you don’t mind the formula for not being waterproof, you should definitely give this a try! I highly recommend this.